Last year, I was all about this sweater from the 3.1 Phillip Lim x Target collaboration. I adored the comfy knit, navy color and subtle jeweled collar. The elements I loved then are still elements I love today...and maybe even more so. With the current chill of the fall season, throwing on this knit sweater is perfect. Such a chic look! Love the silver oxfords! 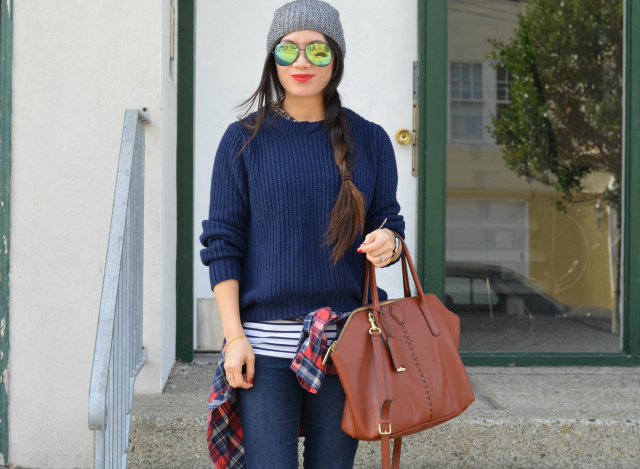 Love this comfy look on you! You always look so cute in beanies! 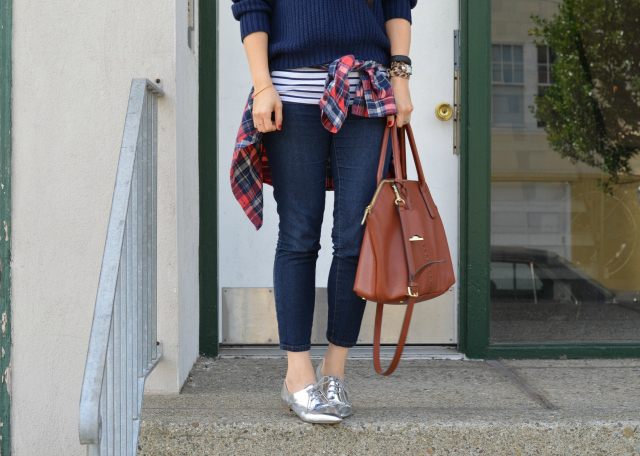 Yes to the plaid shirt and silver shoes! And I love when you buy something from one of the designer collabs and you still love and wear it a year later. You look fab and cozy, Nancy! Very nice layering! And you can throw the shirt on if the sweater is a bit too warm. 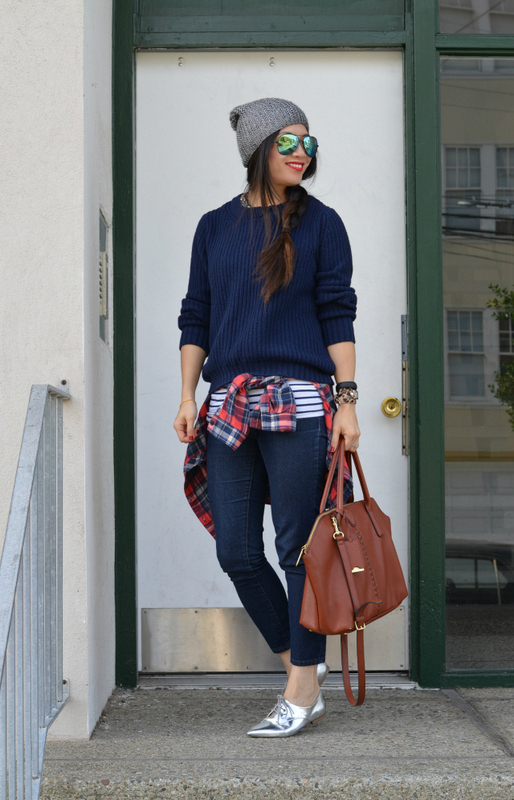 navy, stripes and plaid are always a sweet combination. love your hair nancy! looks great. 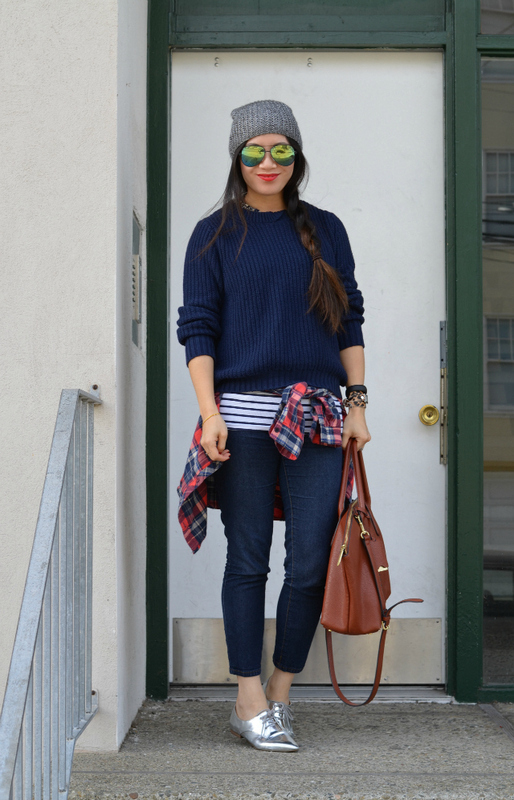 Such a great casual look, I love all the knits and elements in this outfit! I love your navy sweater and the silver oxfords pair perfectly with it. You are a layering queen with this outfit! I know you've worn these shoes a ton, but I love them every time! An updated classic in the best way! The link for the silver oxfords are sold out :( so bummed. Love this outfit! Cute outfit!! Love the beanie! LOVE those silver shoes, Nancy. I have been looking for a pair myself!